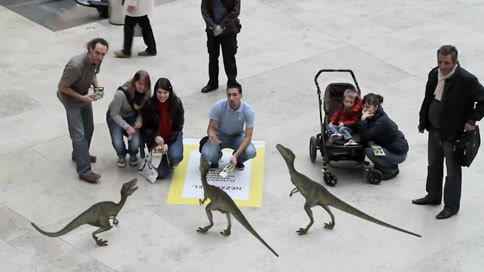 British digital agency Appshaker did an augmented reality project for National Geographic Channel in a mall, allowing passersby to watch themselves "interacting" with various animals and dinosaurs on a big screen. The effect isn't unlike Who Framed Roger Rabbit, by which I mean it's awesome and toes that line between advertising and art installation. Plus, it's way better than what usually passes for foot-traffic entertainment in malls. I mean, really, no living statue is going to compete with rocking out behind a T-Rex.